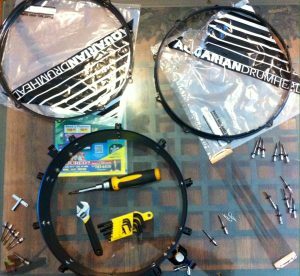 Start with the drum heads, tension rods and washers and both drum rims removed from the drum and with a screw driver tighten but not over tighten all the tuning lug screws and shell hardware screws. After, tap the shell while holding a lug and hear the fundamental tone of the drum. This tone is ideally what you want to tune each drumhead to. Now is great time to clean and polish the shells, rims and hardware. If when taping the side of the drum you hear a rattling from inside a lug or hardware, remove it and loosely pack it with cotton and then reattach it to the drum. Replace the bottom resonant head first. 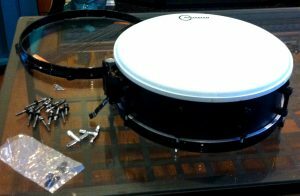 Make sure the bearing edge of the drum shell and inside collar of the drumhead is clean before putting it on the drum. Next, put the drum rim on, lining up the holes with the lugs and screw in each tension rod with washer into each lug. Tighten each tuning rod individually right to the point of contact with the rim and washer where they just begin to turn together and then loosen by a ¼ 90 degree turn counterclockwise. Do this for each tension rod and then re-center the drumhead within the rim and bearing edge with the tuning rods straight down into each lug. This is the STARTING POINT to tune the head and this process works with all drums. For even numbered lug drums, use 2 drum keys straight across from each other and rotate both keys simultaneously clockwise for a 180 degree turn and then move to the next set of lugs skipping a set in-between (odd numbered lug drums just turn one tension rod at a time going across from each other to all lugs). Work your way around the drum using both keys simultaneously (or one lug at a time for odd lugged drums) until you have put 3 complete turns (6 full 180 degree half turns) on each lug. Remember to tighten ALL the lugs each time you go around before turning the lugs up the next half turn. Now with the drumhead tightened, check for even tuning between each lug by tapping with your finger or drum key at each lug about 1.5 inches in from the rim. If a pitch is too high, always loosen the rod to below your desired pitch and then tighten up to your new desired lower pitch to make sure the tuning will stay. Once the pitch and tone is relatively the same at each lug, you need to “seat” the drumhead to the bearing edge by gently pushing down in the center of the drumhead with your palm about a 1/4 inch. Then even out the pitches again at each lug by tapping and tuning and grab a hair dryer! Heat the drumhead with a hair dryer in a controlled circular motion around the rim within a few short seconds for a couple rotations a few inches back from the bearing edge. You are not trying to get it too hot just settled with the bearing edge. Once the drumhead has completely cooled you now want to loosen the drumhead like you tightened with both drum keys across from another (or one at a time on odd lugged drums) with 90 degree turns counterclockwise now. You want to check the tone of the drumhead each time you complete one cycle of loosening to hear just when the drumhead loses its’ nice ringing quality and then re-tighten ALL lugs by only 45 degrees clockwise. Even out the pitches of each lug 1.5 inches from the rim with tapping and tuning. 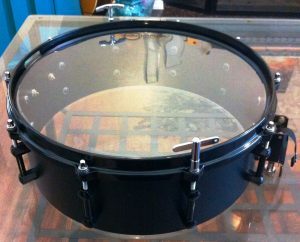 This is the lowest the drumhead will sound good at and a great starting point. Flip the drum over and do all these steps again with the top batter head. While muting the drumheads with your hand and carpet, tap the shell and listen for that tone we referenced when the drum heads, rims, rods and washers were removed. This is the pitch you want to match for the drumheads on both the top and bottom for the most resonant sound. After all the drumheads are in tune with themselves and their shells, you can now play with a great resonant sound. After breaking them in by playing for a while, you can tune them lower in pitch by tuning the all the drumheads to their new lowest resonant points like before to get the deepest sound from your drumheads and drums. Fine tuning even further, you can step each drum up in note intervals starting with the kick drum and working your way up with the lowest floor tom, then lowest rack tom and then snare drum using the classic “wedding song” note jumps when you hum “dum daa da dum” to get a nice spread between all the drums. I like to tune the bottom resonant snare head tightest and highest pitched compared to the other heads on the kit and tune the top batter snaredrum head tighter and higher pitched when compared to the rest of the drums in the kit. If you follow this process your drumheads will last a very long time and your drums will sound awesome! I hope this helps you tune your drums better, let us know! 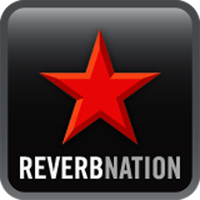 This entry was posted in Uncategorized and tagged Drum Tuning, Drums, Drumset Tuning, How To Tune Drums, Tuning. Bookmark the permalink. I’ve visited and read your full article that you have described on your website about drum set tuning. This is a really great and more effective idea! Glad you were able to learn from it, rock on!